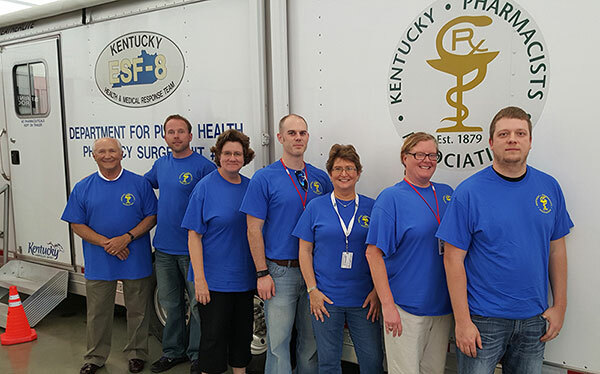 Earlier this year, QS/1 partners, the Kentucky Department for Public Health (KDPH) and the Kentucky Pharmacists Association (KPhA), participated in a showcase to display the region’s overall capabilities to respond to a natural disaster or emergency and demonstrate services the state could provide, including fire, police, pharmacy and other disaster-response resources. At the event, KDPH showcased its mobile pharmacy unit that would provide pharmaceutical services. The event was attended by local and state government officials, hospital administrators and other healthcare partners. QS/1 Regional Training Representative Lisa Larmour and Hardware Technician Stephen Robinson attended the event to demonstrate how medications would be dispensed in an emergency situation. Through a vendor relationship, KPhA utilizes QS/1’s NRx® as the pharmacy management system for the mobile pharmacy. 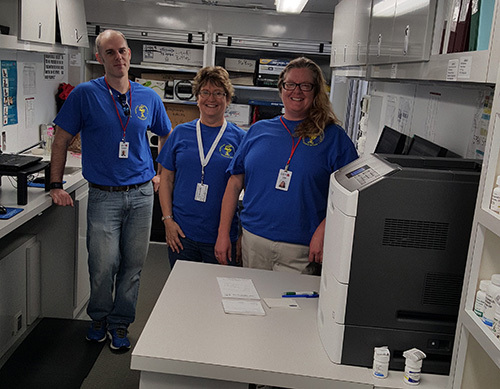 The 28-foot-long mobile pharmacy trailer is managed by KPhA and can provide patient counseling and care, immunizations, public health education and medication preparation and dispensing. The mobile pharmacy is pulled by a large truck and has its own generator, water tank, electricity, secured internet and is fully self-contained. At the showcase, Larmour said they replicated how medications would be dispensed in the event of an emergency. KPhA also has an extensive security plan that KDPH would operate that includes on-site, around-the-clock security. 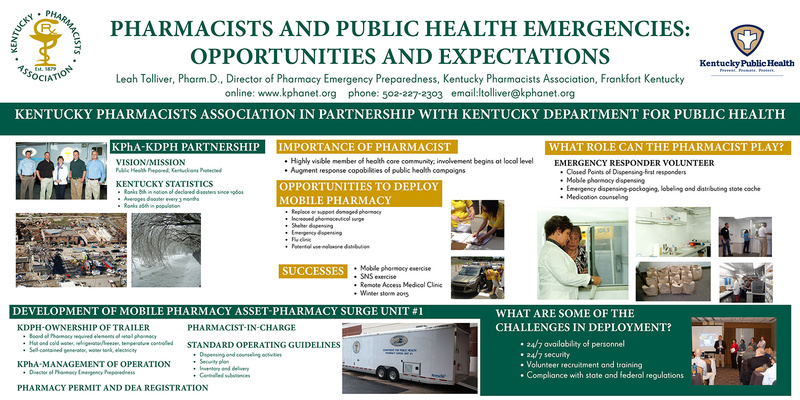 Leah Tolliver, Pharm.D., director of pharmacy emergency preparedness for KPhA, said if the mobile pharmacy is activated in an emergency situation, she has procedures in place for ordering and delivering drugs, and pharmacists and student pharmacists from KPhA to staff the pharmacy. “I’ve developed a formulary of medications that can be ordered at a moment’s notice once the mobile pharmacy has reached the deployment site,” she said. While not in use, the mobile pharmacy is stored in a warehouse without medications. Tolliver estimates it would take four to six hours to have the pharmacy fully stocked, if there were no barriers, such as road closures. She would alert the wholesaler at the onset of an emergency while state agencies assess and make a determination as to what type of aid is needed. The main focus of the mobile pharmacy, she said, is to provide maintenance drugs for the affected population who cannot get to a pharmacy or those who may be nearby due to an evacuation and either weren’t able to bring their medications with them or, depending on the length of the event, have run out of their medications. The mobile pharmacy is designed for emergency-response settings, however it will be used for public-health events in the community too. KPhA takes it across the state to pharmacy meetings, local health departments and colleges of pharmacy for a chance to introduce the valuable asset to the public. The mobile unit could also be used in non-emergency situations. “We might take it to a county where the health department is going to provide free flu vaccines to the uninsured and use the mobile pharmacy to administer the vaccines, because in Kentucky, pharmacists are certified to immunize,” Tolliver said. She added, it was also used once at a medical clinic where physicians, dentists and ophthalmologists provided services for the uninsured, and they were able to fill their prescriptions onsite at the mobile unit. “We will continue to use it as much as possible in order to help public health as a whole with whatever program we might be able to be part of,” she said. Currently, the mobile pharmacy has been activated to dispense naloxone without a prescription, to the public, according to a physician’s protocol. Tolliver and Larmour worked together to create dispensing procedures for potential deployment. They also keep the unit up to date by running quarterly updates and filling test prescriptions to ensure it is operating correctly. “If we were to be deployed, volunteers would actually do the dispensing, so we put together a quick training guide that includes just the things they need to know to get a label printed,” Tolliver said. “We needed a straightforward guide that shows how to enter the patient, doctor, drug, print the label, etc. Kentucky, Alabama and Michigan are currently the only states in the country to have freestanding mobile pharmacies.“Some pharmacies may have something similar to a mobile pharmacy, but they aren’t necessarily mobile,” Tolliver said. Some pharmacies may open an additional dispensing station in an emergency situation, but what makes the mobile unit unique is that it can be pulled anywhere. Kentucky purchased the mobile pharmacy because of the number of disasters in the state, which averages one every three months. Tolliver said the state is ranked sixth in the nation for the number of natural disasters and experiences everything from ice storms to tornadoes. 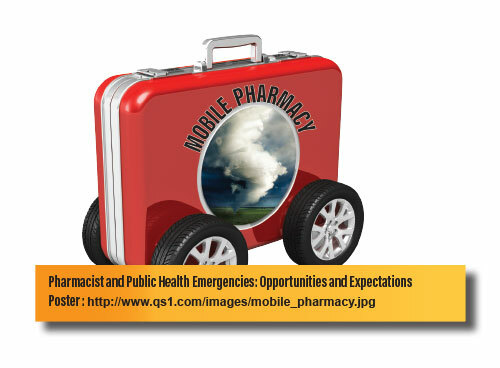 The National Association of County and City Health Officials (NACCHO) recently invited Tolliver to a national preparedness summit to present a poster she created that outlines the mobile pharmacy, its uses, successes and barriers. The Centers for Disease Control and Prevention (CDC) saw the poster at the summit and wanted to use it in hopes of securing funding for similar units in other states. This month, QS/1 will again assist KPhA with a demonstration, but this time it will be a two-day, simulated statewide disaster and will include every agency that would respond. “We want to make sure it’s ready to deploy in a statewide disaster,” Tolliver said.